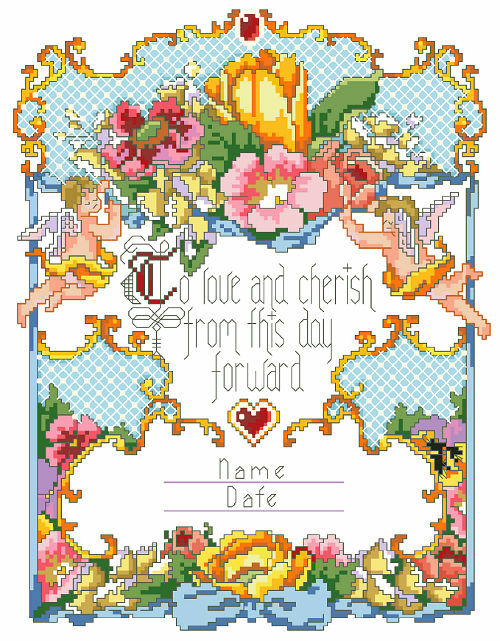 “To love and cherish from this day forward” is declared for all to see that two hearts are bound in matrimony. Cherubs surround the luscious spring bouquet of flowers along with golden baroque style scroll-work. An alphabet is included for personalization for that special couple. Contents: Stitch Count 120w x 156h Finished Size on 14ct: 9" x 12"